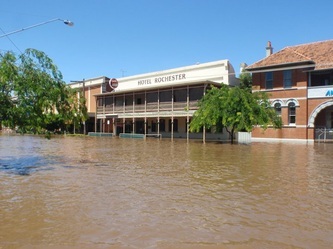 The January 2011 flood, which engulfed the western and central parts of Victoria, was the worst in the community of Rochester’s recorded history. 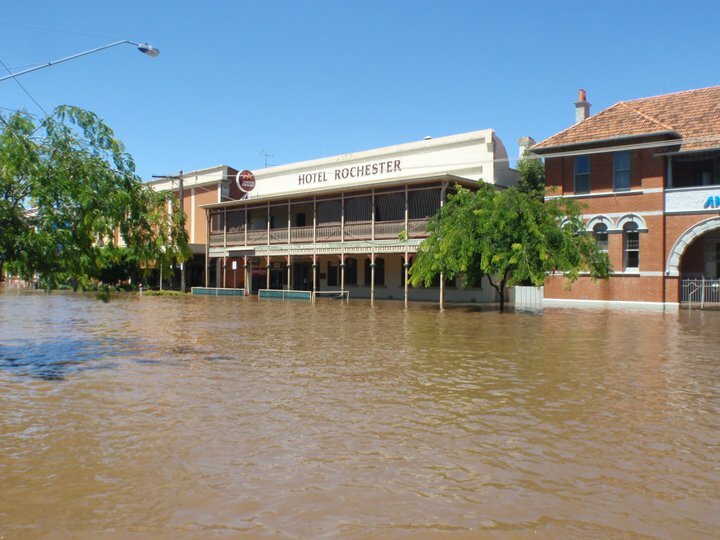 The town’s residents and patients from the local hospital had to be evacuated as the Campaspe River reached record levels due to heavy rains. Thousands of sandbags were rendered useless as flood water inundate properties, local businesses and roads. Heather Wickham, a nurse who grew up and lives in the community of Rochester talks about her experience. "I’m a nurse who used to be a home birth midwife and a midwife for the Rochester and Elmore District Health Services hospital for many years. A lot of babies that I’ve seen born in the town played and grew up with my children. Rochester is a fantastic little place to live in. My home backs from the river but I’ve always thought it was high enough as it never went under during earlier floods, not even during the 1950’s. I remember it was the middle of summer and on the day of the flood the sky was bright blue. It rained heavily days before and the reservoir upstream was releasing excess water directly to the Campaspe River. I felt like a frog in a pond of water, hoping that it will stop rising. As it got darker, my daughter wanted me and the rest of the family to head towards safer grounds. She said that, on her way to my home, she saw mass evacuation taking place across town. By the time we left, the water outside was up to my chest and it continued to rise. I couldn’t believe I placed my family in such a risk. Half an hour after my family left, the whole town was ordered to evacuate. 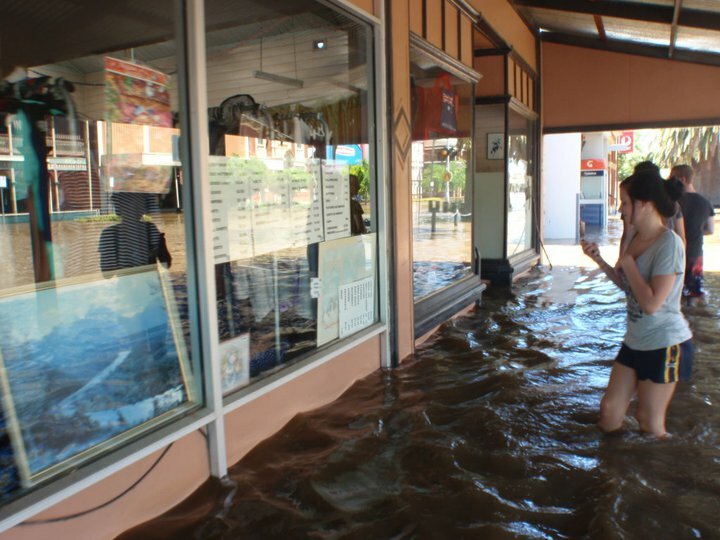 But the flood would not ease and eventually, the evacuation center had to be evacuated as well. I came back a week after and all I thought was how lucky I was. There was disgusting muck everywhere and all the floorboards buckled but it was nothing compared to what other families had to endure. One good thing that came out of the flood was how everyone pulled together for the town. Everyone just pitched in. A day or two after the flood there were piles and piles of rubbish on the street as people came from everywhere to help clean up. I also remembered the acts of kindness. I had a lady from work who gave me a food voucher and a friend of a friend who gave me financial assistance even if I didn’t know who they were. I was just gobsmacked to think that somebody will do that. It was very touching and it helped me out heaps. And yet I felt guilty as the homes of my neighbours beside and opposite me have been wiped out. Two years after, the town looks great. It’s clean and beautiful. What the flood left, aside from the sign post along the river which shows how high the water was, were properties up for sale even if housing prices were negatively affected by the flood. Nearly every second or third home seems to be for sale. The price of insurance also increased for everyone. My premium went up by $6000. I can’t get a $6000 pay rise. I had no way of covering that. I found another provider but I’m still paying a lot of money compared to what I was paying before the flood. I’m worried that as people leave the town, it would lose its sense of community and camaraderie. In the light of my experience, we need to wake up, take notice of climate change and do something about it. I think that we’ve had it too good for too long in Australia as compared to other countries who are experiencing climate change. We have to do something about it now." 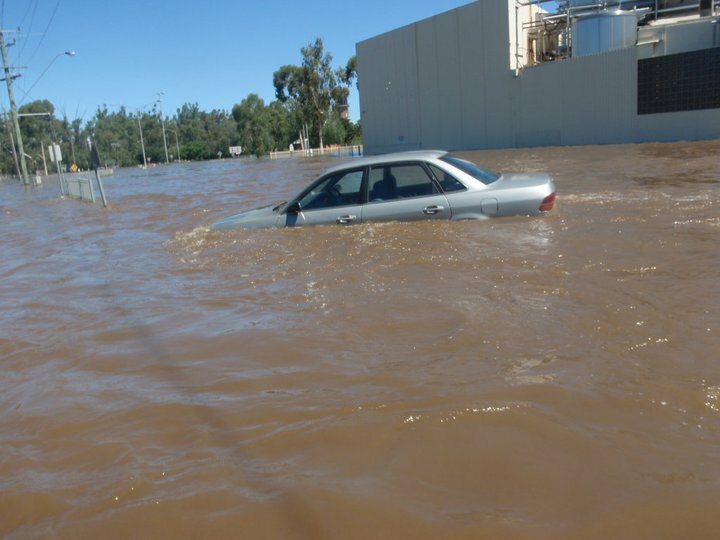 The January 2011 flood in Victoria has been classified as a ‘1 in 100 year’ event; but it doesn’t mean it will not occur again in one’s lifetime. The connection between a warming planet and more rainfall is straightforward. Higher temperatures lead to more water vapour content in the atmosphere thus creating more rain. The severe flooding across Australia in 2010 and 2011 has already raised the question of a possible link between the floods and human induced climate change. The Rochester Flood Event - Documentary from Shon Productions on Vimeo.